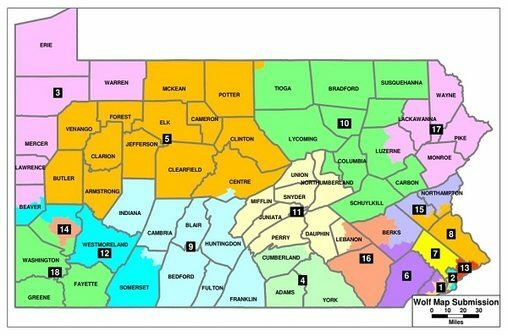 HARRISBURG, PA (WSKG) — The deadline has come and gone to submit congressional map proposals that meet the Pennsylvania Supreme Court’s new guidelines. When justices first declared the maps unconstitutional about four weeks ago, they ordered the GOP-controlled legislature and Democratic Governor Tom Wolf to negotiate a compromise on new ones. Ultimately, House and Senate Republicans, House Democrats, Senate Democrats, Governor Tom Wolf, and Lieutenant Governor Mike Stack submitted maps completely independently. All parties to the case were technically allowed to file maps; a group of Republican activists who intervened in the case sent in one, and the case’s Democratic petitioners and the League of Women Voters submitted two. All parties’ maps vary significantly in terms of partisan advantage, though overall they do make districts more compact, and to varying degrees they divide fewer municipalities. Similar points of contention crop up across maps. Key questions include how much Montgomery County is divvied up, whether the Philadelphia districts reach beyond city limits to harness some more-conservative voters, which cities Reading is packaged with, and whether incumbents stay in their districts. The various parties to the case approached the redistricting process differently. House and Senate Republicans worked largely with existing staff members who have previous Pennsylvania mapping experience. They said they didn’t take partisanship into consideration at all, and ended up with a map with a relatively similar GOP advantage to the current one. The state Supreme Court has said it will either pick a map by Monday, or draw its own. It’s unclear how exactly justices will judge the submissions. They are being advised by Nathan Persily, a Stanford Law professor with a background in drawing political district maps. He has previously assisted judges in New York, Connecticut, North Carolina, Georgia, and Maryland in redistricting cases. As they have throughout the process, Republicans are calling foul over how quickly everything is moving. The court didn’t file its full opinion until two days before the legislature’s deadline to submit a compromise map to Wolf. GOP leaders have said the lack of guidance is the reason they didn’t start drawing a map in earnest until 48 hours before it was due–a decision that left them no time to get a vote from the legislature. The map that they ultimately submitted was from only Senate President Pro Tempore Joe Scarnati and House Speaker Mike Turzai. Senate Majority Leader Jake Corman said he tried to get Governor Tom Wolf on board with asking the court for an extension and taking more time to redraw the maps. The word “chaos,” in this case, is pulled from the split opinion filed by Democratic Supreme Court Justice Max Baer. It’s not just the speed of the redrawing effort that upset Corman and other Republicans, though. “We’re going to have a Stanford professor come into Pennsylvania, and he’s going to act as the prosecutor by presenting the evidence, he’s going to act as the juror by evaluating the evidence, and he solely is going to act as a judge by ultimately ruling on the evidence and producing a map–one person–to the court for the people of Pennsylvania to live under,” Corman said. Governor Tom Wolf has meanwhile stood by the court’s decision, saying he believes it is constitutional. House and Senate Republicans said if the court does in fact draw its own congressional map, they will file suit in federal court.